Philco was the giant of the radio industry in its day, starting out as the Philadelphia Storage Battery company, particularly serving the rural markets' radio battery needs prior to electrification. When their market diminished as farms got power, they adapted and began manufacturing radios powered by the home's AC power. 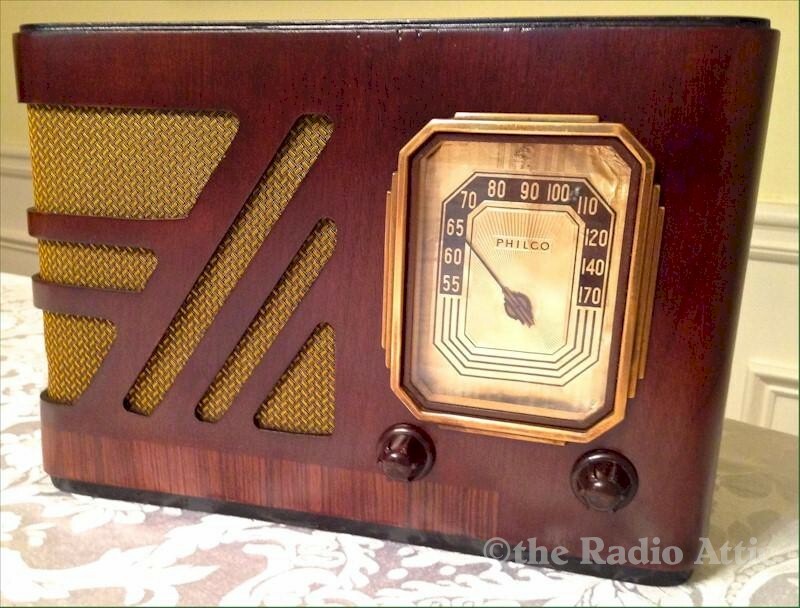 Philco was quite a success and an industry leader for many years, both in design and manufacturing. This Philco is a nice playing and great looking set, showing some beautiful wood grain and tones. It has had both its cabinet and electronics restored and you'll enjoy its nice warm sound as you listen to your favorite ball games or music. The beautiful gold dial and pointer makes this set a real pleaser. 11-1/2"W x 7-1/2"H x 6"D.